Handcrafted in the USA, our Amish Country Shaker Chair is made from fine upholstery and solid hardwood by some of the best woodworkers around. With a variety of fabrics and varnishes to choose from, you can personalize this chair to fit your taste. 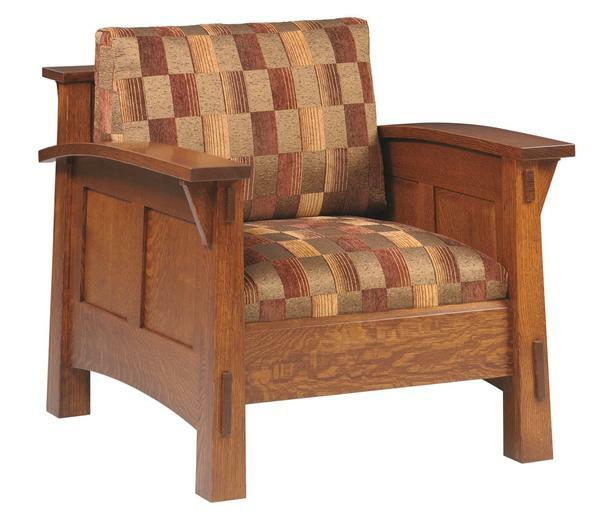 The mortise and tenon construction and fire-retardant foam cushions provide a durable chair that will last for years. Sink into the beauty of a lounge chair that is American made through and through. You can count on this Shaker style furniture to become a fixture in your home. It will be a central part of every gathering, whether you choose to keep it by the fireplace or as extra seating next to the sofa. You and your family will be able to focus on spending time together in the comfort of this superior chair. Choose from solid red oak, brown maple, rustic cherry, cherry, or quartersawn white oak. Please give us a call to request free stain samples in order to confirm your choice: 866-272-6773. No matter what you choose, you can count on the quality of your new lounge chair and on the integrity that it will be made with.